Just a little update, my last post was detailing how I’ve renewed my Minix Box, however I’ve since then essentially retired it. It was still usable (and I may still use it at a different location) I did come into an inexpensive laptop that works flawlessly for driving my TV. Since it has an SSD it starts significantly faster and with the extra horsepower doesn’t chug like the aging Minix. I have started a few new side projects worth noting, I’ll discuss the one that’s taken up most of my time recently. In the past I picked up a few inexpensive WIFI low light webcams. 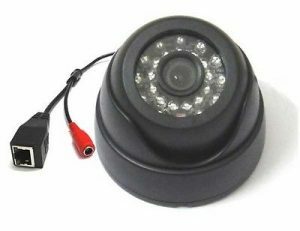 For the better part of 2 years I ran them with some commercial software called WebCamXP which allowed me to configure a wide range of motion sensing security for the cams, off-site storage of security footage, notification and so on. It worked really well, hence me using it for 2 years but… It required a dedicated Windows PC to JUST sit and monitor and detect camera footage. It’s not like I don’t have spare PCs lying around but it did use a significant amount of processing power to do complex frame comparisons to provide accurate motion detection. The cameras also, like most things that are inexpensive, were not terribly reliable, they would often need resetting. Most likely due to the sheer amount of traffic they were generating (5-12 FPS of a 720×540 feed running 24/7 on wifi). For the last 6 months or so I sort of just disabled the system and the cams sat idle. 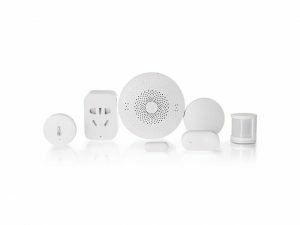 Until I came across a inexpensive deal on DDR around a Chinese home monitoring system, “Xiaomi Mijia 6 in 1 Smart Home Security Kit“. It arrived without issue from China and thankfully works pretty well out of the box. The initial gateway configuration was a bit strange considering the gateway ONLY speaks Chinese, the prompts however aren’t that important and it integrated with my WIFI fine and was able to detect all the supplemental devices just fine. The Kit I got came with the gateway (which acts as the hub for the sub devices), a motion sensor, door/window sensor, remote switch, Chinese specific AC WIFI plug and temperature humidity sensor. The nice thing is that it’s ridiculously easy to add new devices and the devices that came with the package were easily discovered by the gateway and instantly added to the Android app without issue. I used the MIHOME kit for a few months, happy with how it was working. The sub devices run on coin batteries, can be placed pretty much anywhere in the home and work flawlessly. I’m still experimenting with it, I do wish it had a better remote viewing type application that was easier to use than configuring a VPN or other security type layers. I like that it uses significantly less power, less bandwidth with a lot more flexibility on what activities the devices are available to perform. I do like that OpenHAB is developed in Java, something I’m familiar with so making changes or investigating improvements is pretty easy, though the build system is quite complex. I’ve since ordered a few more motion and door sensors for the MIHOME kit which will easily integrate with OpenHAB to provide better coverage for my home. Back in mid 2015 I bought an Android TV box, I had seen around my work office a few iterations of these “tv-on-a-stick” devices but most were half baked ideas, using too weak hardware with too little ram to provide a compelling experience. The idea itself was cool, you would create a device that for all intents and purposes was an Android tablet or phone but without the screen, the device would plug into the HDMI slot of your TV and would come with an external power supply (wall wart) or be powered via USB. Android was flexible enough to make this work so it seemed like an excellent idea. Who wouldn’t want their mobile apps to run on their TV. Youtube, Plex, Chrome, Play Music, Spotify, Kodi, all using your TV for the display. You might say “well this isn’t a new idea” and I suppose that’s true, but keep in mind this was before chromecast became a lot more fully-fleshed out. Even now comparing the flexibility of a TV box vs Chromecast isn’t a fair comparison. The TV box does give you flexibility that chromecast can never compare to. Sadly though most of the initial TV boxes were underpowered so the experience was frustrating. Software crashes, overheating and so on gave the cheap imported devices a bad reputation. 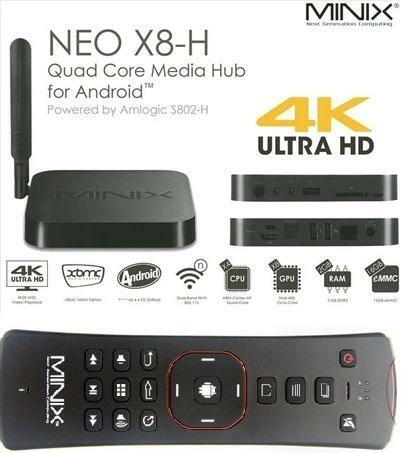 In 2015 I bought a Minix Neo X8-H Plus. It had great hardware, a reasonable amount of ram, all in a nice package. The device worked great but as time went on, and is the case with Android OS updates got fewer and fewer support for the device eventually stopped and software slowly stopped working as well. The OS version was too old for the newer software and often updates from the Google Play store stopped coming due the device’s age. It was stuck on Android 4.2 and to put it in perspective as I write this the newest Android is 8.X. Luckily on a whim this last week I did some searching and it turns out that someone in the Minix/Android community created a hacked Android 5.1 version of the OS for the Minix. This would significantly improve the ability to run newer software. After reading the notes at the minixforums.com and following a few of the posts I upgraded the device and oddly enough the device has regained a lot more life. The developer removed a lot of the typical Android bloat making the device appear a lot more responsive, the new OS allowed me to install a lot of software that simply wasn’t possible on the last OS the device was running (Kodi 17, Steam Link beta as examples). This is one of the reasons why I like Android. Yeah, it can be a chaotic mess, yeah there is little incentive for companies to keep updating legacy hardware for new OS updates, but thankfully, if you chose a piece of hardware that has an active community updating it, there is a good chance you’ll squeak out another year or two out of your aging devices. It cannot be understated. When buying an Android device MAKE SURE you look into the community to see if there is active development for that device. Yes, you might find a similar or better priced device from China but if it doesn’t have anyone developing for it then it’s lifespan will be much shorter than you’d like. It will always be better to pay a little more for a device that has an active community for it. for issue #1 I noticed that there are a number of users in Latin America using SudoTape. To be honest the majority of comments about the app directly have been in Spanish so I think there is likely some value in getting the app ported to Spanish, by reorganizing the strings.xml that will be much easier to do. It helps that I work with people who are natively Spanish so perhaps I can persuade them to convert the app to Spanish if the content is laid out easy in my source. For issue #2 it bugs me that zooming in is sluggish in SudoTape if you have a few markers defined. I have an idea where the slowdowns are but I haven’t spent much time optimizing it. There will be some value in optimizing it as personally I have a few project images that I defined 2-3 markers on and the app seriously slows down when zooming. I also bought a tablet this past week. woot.com had a sale on a Viewsonic gTablet which on paper is very similar to the highly touted Motorola Xoom, except it was less than 1/2 the price. Sadly Woot wouldn’t ship to Canada but my parents are snowbirds and live in Arizona during the winters so I had the device shipped to them. I’m pretty excited (being your token male gadget lover) but I won’t receive the device until Easter at the earliest. I guess it will give me time to do some reading and think of writing an app for the thing. Luckily XDA has a great following for the device so there will be a lot of fun had modifying it as well. I’ve been out for a while, I haven’t done any real software development outside of work for a while.. just taking a break. I bought Mafia 2 on Steam the other week which was on sale, I hadn’t finished or played a game for a while so it was nice to take a break. The other day a friend from work had me look at his cheap Android tablet. It was a cheap iPad ripoff from China but being a geek I like gadgets so I took the device home to play with it. My friend wanted to get Honeycomb on the thing but 1) Honeycomb isn’t officially released 2) there is NO XDA support for the device 3) the device is pretty slow. It has a decent clocked CPU (1ghz) but only has 256 MB of memory and that 1ghz processor is the old Arm11 which from what I understand is slow and inefficient. Nonetheless it was a fun experimentation and gave me a new appreciation for tablet computers. Now if they would finally come down in price. It seems to me that all tablet computers are overpriced. For the amount the cheapest high end device that is being sold you could get a pretty great netbook (or if you shopped around a fully usable Laptop. Sure you could argue that a tablet is a lot more portable but I can guarantee that the laptop is also a lot better at doing computer type things. It’s likely the ‘it’ factor that tablets have that is driving their perceived value up. With the release of Honeycomb there will be a lot of competition though so with luck we’ll able to pay a lot less for even more powerful device before the end of 2011. Then it will become a matter of “is there enough tablet specific software to make the purchase a lot more attractive”. When submitting your app to Google marketplace you’re given a nice screen that shows where people who ran your app encountered bugs. You can use this screen to help point out problems in your code that perhaps you missed or overlooked. 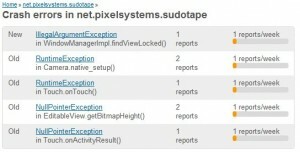 SudoTape v1.2 and v1.3 now available on the market addresses a few of these issues. Some bugs make sense and it’s pretty easy to see how the problem occurs but some bugs you can see how it would crash but it’s really difficult to envision how the code would have crashed there. Sadly not many users actually write in the report how they encountered the crash to give you input on how to fix the bug. I adjusted the camera media manager of SudoTape and updated CameraTest accordingly. It seems to work even better on my device, hopefully others will agree. I always ignored the ‘share’ option when taking a picture with the built in camera on my phone but after using it a few times with Facebook I realized how nice it worked. I plugged this functionality into SudoTape so it’s now able to accept and use the share option as well. Seems to work better for my Galaxy S than the camera capture that exists in SudoTape. I think there are still timing issues in the capture process even with all the work I did regarding capturing images and the CameraTest prototype. I finally released SudoTape to the market. The last stretch was around testing and getting some of the final artwork done. I initially listed it in the photography section of the market but this morning I revised it and put it in the tools section. You don’t really need to have a camera on your device in order to use it so it makes more sense to put it in the tools section. I don’t know if the market automatically filters stuff out so even if you don’t have a camera and the app doesn’t really need a camera I’m not sure if you’d see it as available to download or not. Not that it matters though, I presume most devices come with at least one camera now anyway. I had problems creating a signed APK, I never really read anything about it and Google’s information online is sketchy at best, at whatever documentation I found was related to Eclipse so it wasn’t much help since I use IntelliJ. Luckily IntelliJ’s created signed APK wizard wasn’t too tricky so I uploaded the app and some art/screenshots last night. Going to see if anyone downloads it to see how much I want to support it. I’d like to add some other features like saving the files to DropBox, perhaps unit conversions on the define markers options dialog, etc. If there is little interest I’ll hold off adding more features and think of a new project. I finally figured out how to use GitHub. It didn’t work well at all with IntelliJ, mostly because the learning curve is pretty vertical regarding to setting up permissions and connecting github with your machine (pgp keys, etc). You can read about my first github project here and all the trouble I had getting camera images from the camera functionality on your Android phone into my Android app. My app is functionally complete. I need to do more testing and I have a bug related to importing a photo taking by the device’s camera that I can’t reproduce but the graphic designer reproduces on his HTC Evo. I need to get a logcat from him to try and troubleshoot where the problem might be. I’ve sent out feelers to some of my other contacts on Android to see if they can reproduce the problem. I need to get the final artwork from the designer as well as design an about screen as well. There are a number of ideas I have related to improving the app but I want to see how it does on the market before adding many more features. Probably one of the nice things about releasing a free app, if no one uses it I feel less compelled to update and improve it. I like what it does though and I can see myself using it regularly so at any rate it does what I set out to have it do. I spent some time looking at GreenDroid . I like the idea of a unified library to help aid in developing apps but I couldn’t get it to work very well, not in IntelliJ and not outside of his sample application. Either way there wasn’t going to be easy way to integrate it into all the work I had done already. I really liked his QuickActions work which is what lead me to GreenDroid but in the end I had to abandon using it. I stumbled on some work that Lorenz did around QuickActions and the code was free to use, easy to understand and easy to modify which was pretty exciting. He had a bunch of samples that were easy to build and play with which was always nice. I started looking into new projects but find myself intimidated by all the dp dpi px and other screen resolution type issues that people regularly complain about. It’s probably just a matter of doing some reading and experimenting. My project is coming along nicely. I learned the hard way that the Android emulator is quite different than an actual device so when I got my phone back running my project on it pointed out a number of issues that I hadn’t thought of because they weren’t exposed with the emulator. If you are launching an custom intent/activity from preferences DO NOT specify data= in your preferences.xml unless you are set to handle it, otherwise you will get a “cannot find activity” exception. This took me several hours to discover, a lot of head scratching and swearing because I got lazy and never deleted the data= part that I copied from Google’s example code. The bundle as the argument to onCreate() for your activity is actually very useful and tied to onSaveInstanceState(), this I supposed is common sense but no example I read actually showed them being used together so some digging exposed to me how to use it, very handy. PreferenceManager.getDefaultSharedPreferences() is super easy to use, beats property file loading/saving which I use at work a lot. this information on screens proved very important to several UI problems I was having (multi-touch), should be fundamental reading for anyone learning Android programming.